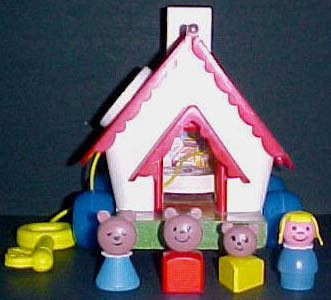 Description: This is the 1st Little People set to feature figures with plastic heads (the 3 bears), and is also one of the smallest Little People bases. 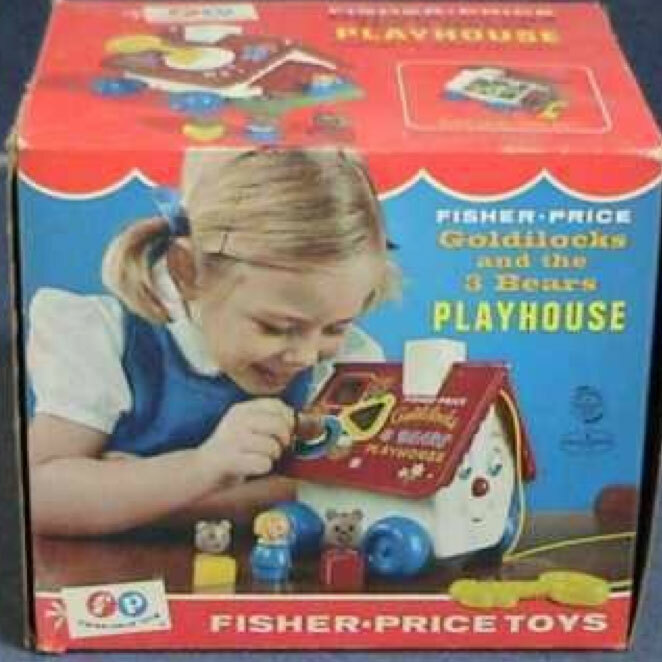 Like the then-current #979 Dump Truckers and the #136 Play Family Lacing Shoe, this set also taught shapes. The 3 bear figures fit through appropriately sized holes in the house's roof and could be placed on corresponding places on the floor's lithograph. This set's high market value is reflected mainly in the price of the exclusive bears themselves, whose ears had a tendency to break off without much effort. Still, at just 5 pieces, this is one of the easiest sets to complete. 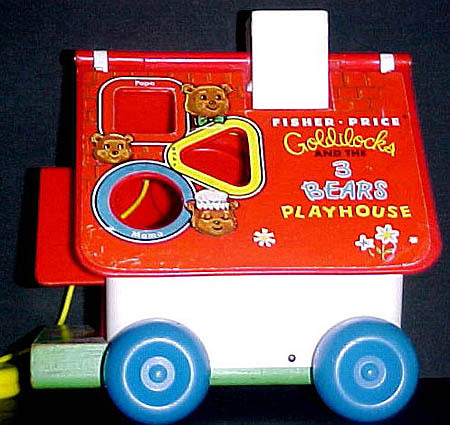 B151 - Small white house with a green wooden base that rolls on 4 blue plastic wheels. The house has a red roof with a white chimney. One half of the roof has 3 shaped holes (square, circle and triangle) for the #151 accessory figures to fit into. The other half of the roof has a round white "lock" with a keyhole that turns. The key on the end of the pull-string fits into the keyhole. The key is a SEPARATE PART FPT952. The front of the house has a white paper litho with a picture of a smiling face. The eyes move up and down and a bell rings as the house rolls. The back of the house has an open doorway with a red awning over the door. The inside of the house has an attached table and lithos to depict a "porridge" scene for play acting the story. Overall size: 6-3/4" long, 6-3/8" wide, and 7" tall. 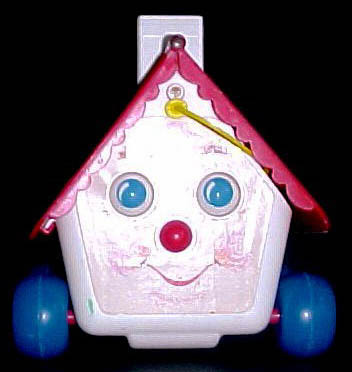 FPT952 - The house is pulled by a plastic pull string with a large yellow plastic key on the end. The key fits into a white play lock that is located on top of the roof. FGWW - Goldilocks - Blue all-wood girl with a white ruffled plastic collar and blonde hair in braids. ICWP - Papa Bear - Red wooden square body with a round plastic head that has 2 small round ears. The head is attached to the body by a metal rivet. IBWP - Mama Bear - Blue wooden round body with a white ruffled plastic collar and a round plastic head that has 2 small round ears. The head is attached to the body by a metal rivet. IDWP - Baby Bear - Yellow wooden triangle body with a round plastic head that has 2 small round ears. The head is attached to the body by a metal rivet. Made in late sixties, early seventies. Made only with a wood base and plastic head, as shown. Unlike the 3 bears above, this girl was used in other sets, and was all-wood in this set. This set was sold in other countries, a boxed Mexican set is shown in the photo on the left.